Super LII is just around the corner and, shocker, the New England Patriots will once again be representing the AFC. However, for only the third time in the Super Bowl era, the Philadelphia Eagles have prevailed over the NFC and will look to dethrone the greatest football dynasty in history. And they'll be cheered on by rabid Eagles fans, including a few famous celebrities that are looking to make history. 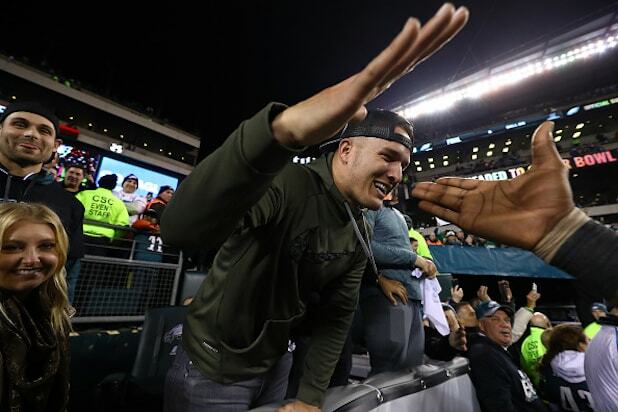 Mike Trout Los Angeles Angels superstar Mike Trout is a die-hard fan of the Eagles. Not only did he show up at the NFC Championship Game against the Minnesota Vikings, he is also a season ticket holder. 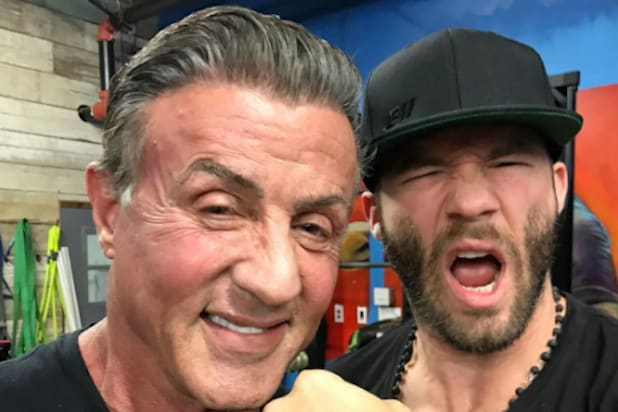 Sylvester Stallone A Philly legend for his portrayal of Rocky Balboa, Stallone (pictured here with Julian Edelman) has already picked the Eagles to win this year against Tom Brady and the Patriots. Joe Biden Former Vice President Biden tweeted his support in 2016 for then-rookie quarterback Carson Wentz, who was instrumental in helping the Eagles claim the division and conference championships this season. However, he may have cooled the feelings down somewhat after his wife also became enamored with the QB. Bob Saget This Philly native has but one dream: for his Eagles and his L.A. Kings to play each other in a mixed-sport grab bag. "You got your Kings coming off the ice, and you got your Eagles coming off the grass ... they go into each other's world ... The Eagles are slipping because they're on ice all of a sudden, the Kings are just trying to get across the lawn ... None of it's fair, that's what's so "Mad Max" about it." Maria Bello Born six miles from Philadelphia, Maria Bello is not shy about making her Philly fandom known on social media. Bradley Cooper Not only did Cooper's breakout performance in "Silver Linings Playbook" feature the actor as a die-hard Eagles fan, but he has been seen in owner Jeffrey Lurie's box singing the Eagles fight song. Kobe Bryant Though he has been booed countless times when playing the 76ers, this Philadelphia native still holds a special place for his hometown teams. "I absolutely love Philadelphia and love those fans," Kobe said. Tina Fey Fey is such an Eagles fan, she couldn't resist injecting her love into her hit show "30 Rock." 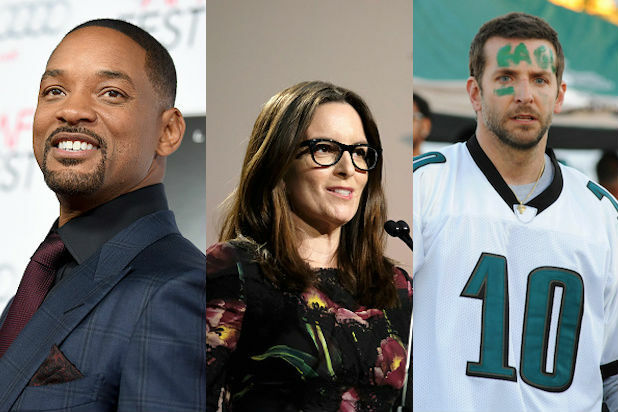 Will Smith Smith is such an Eagles fan, he almost didn't star in the drama "Concussion," which revolved around a doctor trying to convince people of the medical dangers facing football players. "I was deeply conflicted," he told Charlie Rose during an interview. "I grew up in Philadelphia with my Philadelphia Eagles ... It's a very inconvenient truth." Rob McElhenney and Kaitlin Olson Things could get frosty on the set of "It's Always Sunny in Philadelphia." On one side, Rob McElhenney and Kaitlin Olson for the Eagles. On the other, Charlie Day stands as a die-hard Patriots fan. Say it ain't so, Charlie! Questlove Not only did the Roots founder perform at the NFC Championship wearing his Eagles gear, he immediately took to social media to celebrate the Eagles' victory. Ryan Phillippe Growing up just 30 miles down I-95, Phillippe has revealed that most of his jerseys belong to ex-Eagles stars like DeSean Jackson and LeSean McCoy, but has a lot of hope for Carson Wentz. "I just bought my son a Carson Wentz for his 13th birthday," the actor told Rich Eisen during an appearance on the sports radio host's podcast in 2016. Miles Teller A fan of all Philly sports teams, Teller has described having no Super Bowl wins as "frustrating," but is enjoying life now after his Eagles earned the NFC Championship. Pink Already on board for the Super Bowl Halftime Show, the Grammy-winning singer was ecstatic to find out her hometown team had made it to the championship. "Ummm. I’m singing the national anthem and the EAGLES ARE PLAYING?!?!?!"